I must say that the bucatini noodles were wonderful. A perfect complement to this quick and luscious sauce. The added lemon zest and juice in this version of the classic dish balanced nicely with the richness. I also loved the hint of spice from the freshly cracked black pepper. This recipe was adapted from Bon Appetit, contributed by Chris Morocco. I served it with roasted asparagus on the side. Absolutely fabulous! Heat oil in a large skillet over medium. Cook pancetta, tossing often, until browned and crisp, 5 to 7 minutes. Add shallots and garlic and cook, stirring occasionally, until softened, about 5 minutes. Add pepper and cook, stirring often, just until fragrant, about 1 minute. Meanwhile, cook pasta in a large pot of boiling salted water, stirring occasionally, until al dente. Drain, reserving 1½ cups pasta cooking liquid. Add pasta to skillet along with ½ cup pasta cooking liquid and 1 oz. 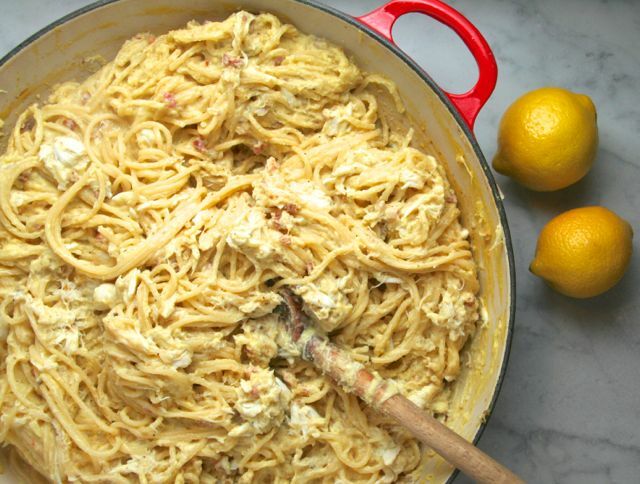 Parmesan and toss to coat. Remove skillet from heat and add egg yolks. Toss again, adding more pasta cooking liquid as needed, until a smooth glossy sauce coats pasta. 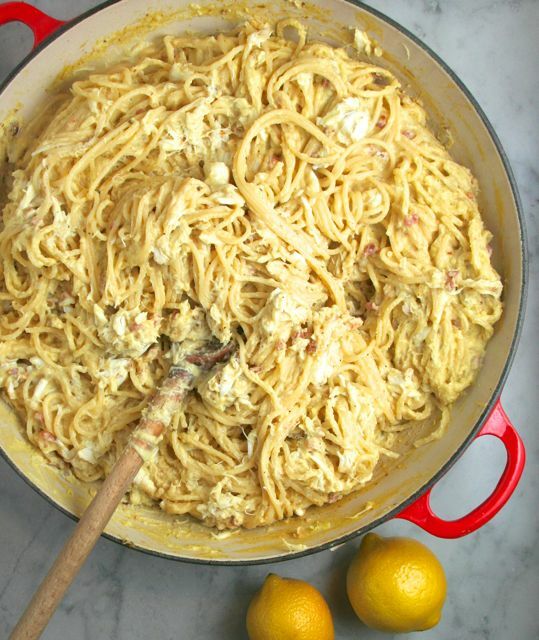 Divide pasta among bowls; top with sliced lemon zest and more Parmesan, as desired. I had an excuse to make this dish a second time when my mom was visiting- she LOVES crab. 🙂 This time I was able to use fresh local bicolor corn from our farmers market. SO good! The sweetness of the corn is very important in this dish as it is barely cooked. We ate with a green salad loaded with CSA veggies. Mmmmm… healthy deliciousness! This seasonal and tasty recipe was adapted from Food and Wine, contributed by Tim Maslow. I used a Vitamix to make the corn cream sauce and used pancetta instead of pork guanciale. The creamless corn sauce is not only healthy- it is unbelievably creamy. Lovely. On a work surface, cut the corn kernels off of the cobs; using the sharp side of the knife, scrape the pulp off the cobs. You should have 4 cups of kernels and pulp. Transfer the kernels and pulp to a Vitamix or blender and puree until smooth. Strain the puree through a fine sieve, pressing on the solids. In a large saucepan of salted boiling water, cook the spaghetti until al dente. Reserve 2 cups of the cooking water, then drain the pasta. Wipe out the saucepan and melt the butter in it. Add the pancetta and cook over moderate heat, stirring occasionally, until the fat is rendered, about 7 minutes. Add the shallots and garlic and cook, stirring, until softened, about 3 minutes. Add the spaghetti, strained corn puree, 1 1/4 cups of the pasta cooking water and the lemon juice. Cook over moderate heat, tossing, until the sauce is thickened and creamy, 3 to 5 minutes; add more of the cooking water if necessary. Season the pasta with salt and pepper and very gently fold in the crab. Transfer to shallow bowls and drizzle with olive oil. Garnish with lemon zest, if desired, and serve right away. Note: The strained corn puree can be refrigerated overnight. 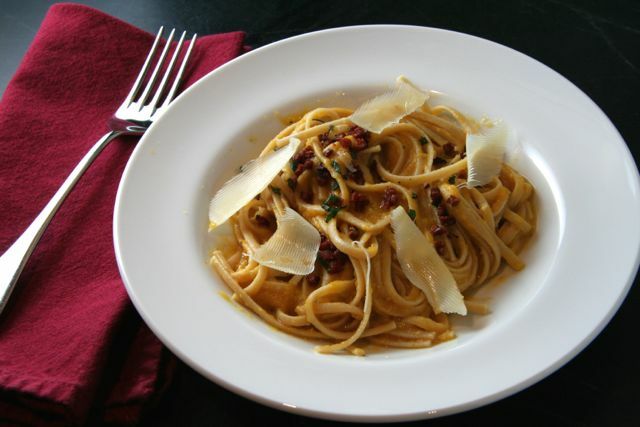 This dish uses pureed squash to create a lighter version of carbonara, one of my husband’s favorites. The result was wonderful– dinner party worthy! 🙂 We loved it. I wish I had made it for Valentine’s Day!! This recipe was adapted from Bon Appétit. Heat oil in a large skillet over medium-high heat. Add pancetta, reduce heat to medium, and cook, stirring occasionally, until crisp, 4-5 minutes. Add sage and toss to coat. Using a slotted spoon, transfer pancetta and sage to a small bowl; set aside. Add squash, onion, and garlic to skillet; season with salt and pepper and cook, stirring occasionally, until onion is translucent, 8–10 minutes. Add broth. Bring to a boil, reduce heat, and simmer until squash is soft and liquid is reduced by half, 15–20 minutes. Let cool slightly, then purée in a blender or food processor until smooth; season with salt and pepper. Reserve skillet. Combine pasta, squash purée, and ¼ cup pasta cooking liquid in reserved skillet and cook over medium heat, tossing and adding more pasta cooking liquid as needed, until sauce coats pasta, about 2 minutes. Mix in ¼ cup Pecorino; season with salt and pepper. DO AHEAD: Squash purée can be made 3 days ahead. Let cool; cover and chill.